After a 12-year absence, TriMet buses will begin crossing the new Sellwood Bridge starting Monday, December 5. This brings a new route for Bus Line 99-Macadam/McLoughlin. 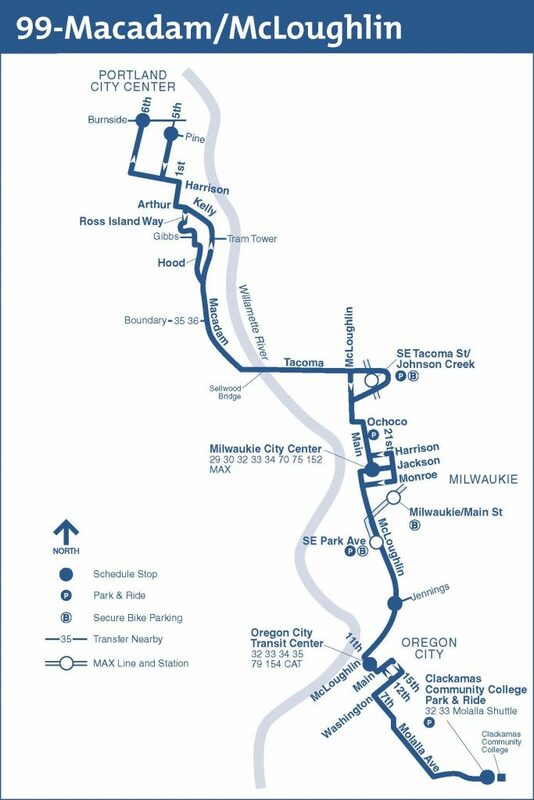 The Line 99, which currently runs from Clackamas Community College (CCC) to Portland City Center via the Ross Island Bridge, will be moved to the Sellwood Bridge. The weekday, rush-hour service will now con­nect CCC, Milwaukie, Sellwood, John’s Landing and Downtown Portland. 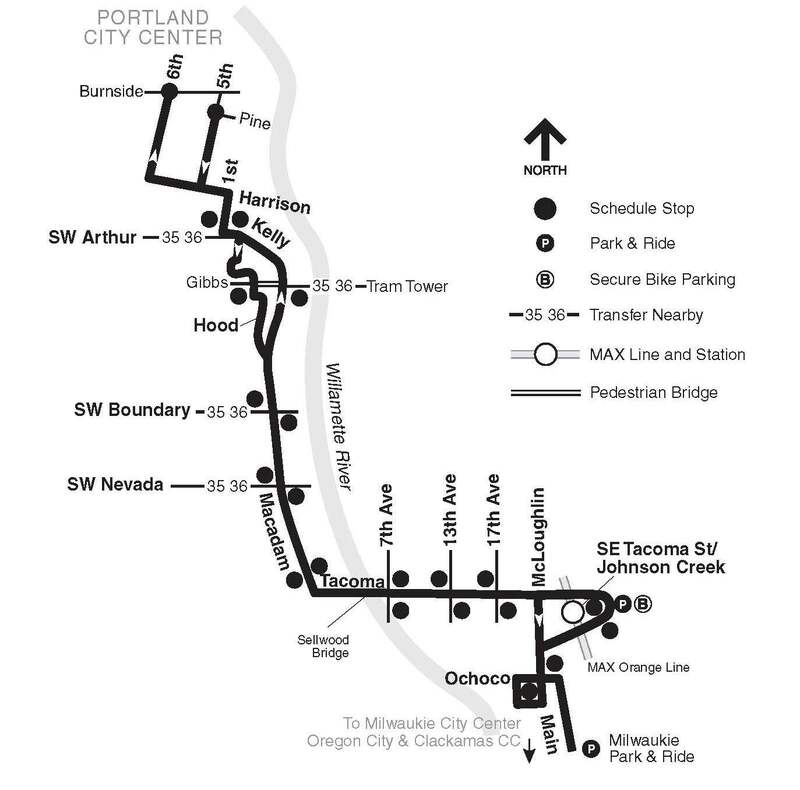 Buses will travel through John’s Landing along SW Macadam Avenue, and connect with the OHSU Aerial Tram via a stop on Macadam Avenue at the Tram Tower as well as a new stop on SW Kelly Avenue near the Gibbs Street Pedestrian Bridge. 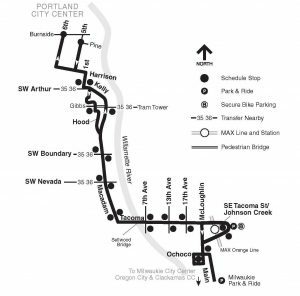 Line 99 will connect riders to bus lines 35 and 36 to Lake Oswego on the west side of the Sellwood Bridge. New stops also will be added at SE Tacoma & 7th Avenue on the east side of the bridge for eastside riverfront attractions. Line 99 riders will continue to connect with the MAX Orange Line at the SE Park Avenue or SE Tacoma St/Johnson Creek stations, as well as to all other MAX lines along the Downtown Portland Transit Mall. New stops along SE Tacoma St. & SW Macadam Ave.
Service will run weekday mornings from about 5:30 to 8:45 a.m. and evenings from about 3 to 7 p.m. Visit trimet.org now to plan your trips for December 5 and beyond. Bus service across the bridge was suspended in early 2004 when Multnomah County lowered the weight limit in order to prolong the safe life-span of the then 79-year-old structure. In 2012, Multnomah County began construction to replace the narrow two-lane bridge. The new Sellwood Bridge touts two 12-foot traffic lanes, 6-foot bicycle lanes/shoulders in both directions, and 12-foot wide sidewalks on both sides. For more on the project, visit SellwoodBridge.org.